The two female chicks decided to take flight on Wednesday morning (06-08-2016). They both made safe landings, one to the top of the Haymarket Building on East Michigan and one on the surface of the parking deck. This of course was not an ideal place to relax for long as people park on the deck when they arrive for work. After a few attempts, the youngster did leap up to the ledge and took a breather. She seemed calm and relaxed as her attendants scurried around trying to keep traffic and cars away from her. A loan of some traffic cones from the Fish window washers (You guys are Great!!) to supplement the rapidly purchased cones were much appreciated and her attendants managed to keep things quiet enough so she could have a full morning and part of the afternoon to rest and sun bathe before her nest physical fitness class. She managed to fly to the Olde Peninsula building and then of course, needed the remainder of the afternoon to rest up before attempting to join her sister across East Michigan. Some practice wing flapping might have more helpful than another nap, since she did not get enough elevation to make it to the roof and had to settle on a window ledge, for, of course, more rest. Her sister in the meantime, stayed on the Haymarket roof all day. Their little brother flew around offering suggestions and encouragement throughout the day and spent quite a bit of time with his sister on the Haymarket roof. He certainly used his time while stuck in the parapet to practice his wing flapping and is a pretty skilled flyer already. By Thursday morning, all three youngsters were safely on rooftops and practiced their flying throughout the day with much improvement. A couple of the youngsters graced their fans with several photo opportunities on the parking deck, but did not stay long. I want to thank everyone locally who have kept us all alerted to the location of the young birds. It is heartwarming to know that so many folks in Kalamazoo are looking out for these youngsters and call when there is concern for a bird’s safety. 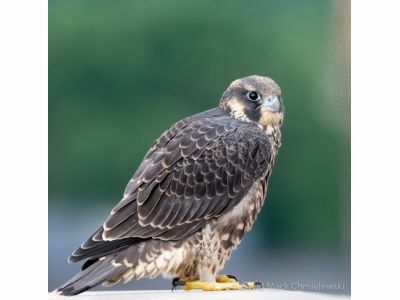 We also appreciate that people recognize that these young birds are not very "worldly" and may not always exercise good judgement (or skill) in where to land and give them a safe distance so they can rest before they resume their practice flights. Without all the public support, the success of the birds would be less certain. The male who jumped early and luckily landed safely on the parking deck roof is doing fine in rehab. He has passed most of his flying tests and will be getting his license very soon. If all goes well, we expect he will be back in Kalamazoo within a few days. Since the birds are not in the nest box, we will discontinue the live stream function. The real time viewing with 5 second refresh will continue for the nest box and parapet cams (and will work better without the live stream taking so much band width).